Whilst opening a very heavy envelope of Chocolate Drive money our office has collected, my lovely workmate hid this little note for me to find. As I carried the coins to the bank to be exchanged for lighter notes, I thought about this note and how important it was. I thought about how many other things I could add to the note, such as the Joy of hugging my children and the Joy they bring to me every day. 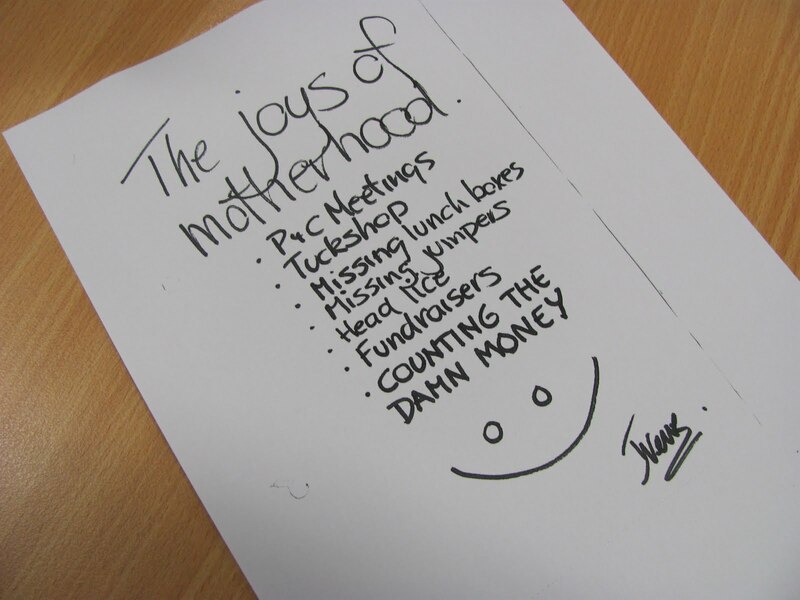 As Mothers, our lives are indeed full of these things on the note, the good and the bad, joining together to make us who we are. I really identify with this. I waited for so long to have these things on the note (maybe not the head lice) because I wanted to be a Mother. Head lice!!! Please let me NEVER have that on my damn list! Good job Michelle, I am so stoked for the blog awards and hope you quickly move to numero uno!!! Hurray! You are too kind...thank you!! It's nice to be included on a list..anywhere!! We only had one case of head lice and my stomach still turns just thinking about it. Yeeechhh! I really love this post! I feel like I have waited forever to be a Mum (I'm 41 with two girls under two years) and I remind myself every day how lucky I am to have my daughters - especially at 3am when I am pacing the floor trying to ease Evie's colic. Motherhood can be hard but it's definitely the most rewarding job in the world!